The volleyball team competed in its first conference home game versus Eastern New Mexico University on Sept. 7. The team lost 3-0 with the first set scoring at 25-27, the second 17-25 and the third 21-25. Sophomore Raven Presley attacks the ball against Eastern New Mexico University during the home game on Sept. 7. Photo by Kristin Silva. 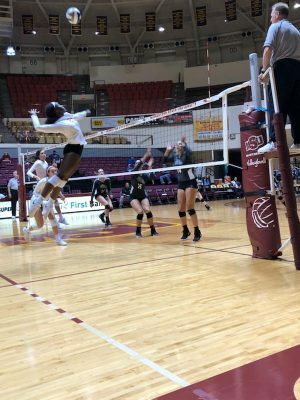 Valerie Armstrong, head volleyball coach, said the team still has some skills to work on, but there are also many strengths that will benefit the team in games to come. Niko McWilliams, business sophomore, said though the team was behind throughout the majority of the game it didn’t stop the crowd from cheering and bringing positive energy to the game. “It was good. I thought the energy was very good from the players even though they were behind. They always work hard to come back, and it was fun to watch.” McWilliams said. Addison Semer, art senior, said the players brought good energy and the players performed well despite losing.